Based on the scholarly work of Pepi Leistyna, Class Dismissed navigates the steady stream of narrow working class representations from American television's beginnings to today's sitcoms, reality shows, police dramas, and daytime talk shows. 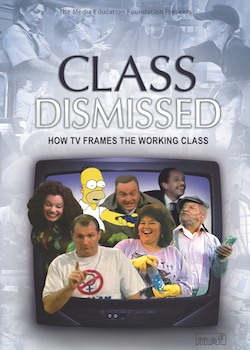 "With incisive political commentary and vivid examples drawn from television shows past and present, Class Dismissed stunningly illustrates how the working class has been (mis)represented in popular culture. Class Dismissed forces us to reconsider our perceptions of and attitudes towards the working class, and shows us how class in the United States is complexly and inextricably bound to race, gender, and sexuality. This is a superb examination that demonstrates the inordinate power of television to frame social categories and their political meaning." "Fast-paced, hard-hitting, and timely, Class Dismissed employs sophisticated theory to critically analyze the way media shapes how people understand and misunderstand class in American society." "Essential viewing for students and researchers who are interested in the political economy of media, media and social change, media portrayals of social groups and issues, and media influence." "Revelatory. Brings to light the political and economic forces that imperil workers, but rarely appear in sitcoms: the loss of millions of industrial jobs, depressed wages, and declining union membership, all at a time of drastic cutbacks in governmental expenditures on health, welfare, and education." "Class Dismissed dares to open our eyes to television's role in disappearing class from the American consciousness. The carefully crafted interviews set against humorous clips show how stereotypes of working-class buffoons distance us from the reality of corporate greed. Class Dismissed drives home the connections between class, gender and race to ongoing systems of inequality and reminds viewers of the importance of raising class consciousness if we are to succeed in forging meaningful models of citizenship in the future." "At last an educational documentary that tackles head on the complex and elusive imaginings of class in the United States. MEF adds an important piece to its growing list of documentaries aimed at exposing the distortions of a corporate controlled media industry. Class Dismissed offers us a sophisticated analysis of TV's changing representations of the working class, beginning with the now largely forgotten "ethnocoms" of the forties like "The Goldbergs", through Archie Bunker and "The Honeymooners", all the way to "Jerry Springer" and "Joe Millionaire." Using a familiar documentary format, the video compresses a complex history into an accessible narrative that both reveals shifts in the way working class people have been portrayed and exposes the ideological effects of these representations."